The Pentecostal in me has held to the belief that God can and does heal/cure people, though why, when, and how remains a mystery. The Rationalist Disciple in me seeks answers that don't always come easily. Bruce Epperly is a progressive Christian theologian who believes that God not only heals, but contrary to folks like John Dominic Crossan, also cures, though like Crossan, he doesn't see such things happening supernaturally. Bruce's most recent book is an exploration of Jesus' healing stories, and in this post he continues a conversation begun last week. He takes up Crossan's challenge and pushes the conversation. I invite you to read the post, perhaps buy the book, and offer your own thoughts. 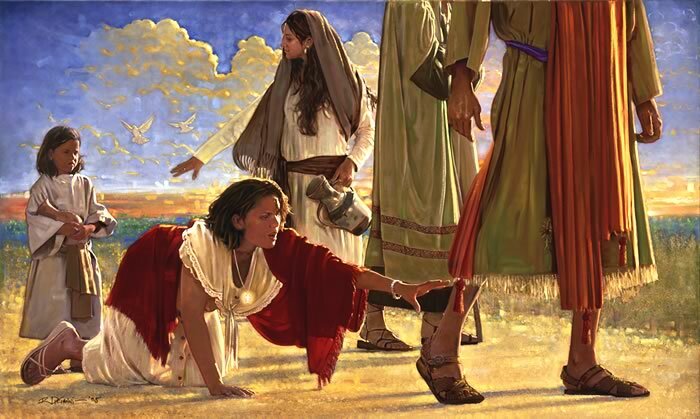 Challenging Crossan: Did Jesus Cure People? How shall we understand the healings of Jesus in a pluralistic, postmodern, and scientific age? Can progressives claim Jesus as a healer, given the growing impact of holistic, mind-body, and global medicine on Western medical science? It has become orthodox in most progressive Christian congregations to dismiss the healing stories as accounts of the early church’s spiritual experiences, at best, and as pure fabrications, aimed at putting Jesus on par with other so-called “miracle workers,” at worst. Many progressives follow John Dominic Crossan’s assertion that Jesus did not and could not cure any disease. (Jesus: A Revolutionary Biography, 82) In the spirit of current sociological understandings of religion, health, and illness, Crossan appropriately distinguishes between “curing” and “healing.” Curing relates to the cessation of symptoms and the restoration to physical well-being, while healing typically relates to restoration to one’s place in society or relationship with God. Accordingly, Crossan sees Jesus’ healings primarily as a testimony to his radical commensality or radical hospitality embodied in his welcoming of religious and social outcasts, whose previous spiritual status was determined by occupation, gender, ethnicity, or physical condition. Jesus’ open table transformed peoples’ lives, Crossan asserts, changing their self-understanding and enabling them to see themselves as God’s beloved children. The healing power of hospitality, and not any type of physical healing, is the central focus of Crossan’s approach to the gospel healing accounts. In contrast to Crossan’s negative understanding of Jesus’ power to heal bodies as well as spirits and relationships, I believe we need to take a new look at the healing stories in the gospels and consider the possibility that Jesus both cured and healed people. Crossan is correct in opposing supernatural explanations of Jesus’ cures, but perhaps Crossan is surprisingly at bit too conservative in his evaluation of the scope of Jesus’ healing ministry. As I suggested last week, we can speak of healings and miracles without supernaturalism; we can see Jesus’ physical, emotional, and spiritual healings as resulting from his connection with the deeper energies (chi, prana, ruach) of creation, the primordial energies of the “big bang,” within which we “live and move and have our being.” From this perspective, we can appropriately speak of transformative energies that emerge when persons are in synch with the energies of the universe or God’s aim at abundant life in mind, body, spirit, and relationships. Jesus’ healings are not supernatural or counter to natural cause and effect relationships, but represent a confluence of energies, quite “natural” to the human condition but typically beyond normal human powers. Irenaeus spoke of the glory of God as a human who is fully alive. In this light, a fully alive person like Jesus – indeed, divine in his humanity – can channel, access, and meditate energies that are extraordinary in impact and focus. These energies are not beyond our abilities to access, but their accessibility depends on many factors – environment, faith, the prayers of others, the nature of the illness, and congruence with God’s vision for our lives. Fully alive, Jesus transformed cells as well as souls. Seeing Jesus’ healing ministry from this light opens us to the possibility of a truly “progressive” Christian progressivism, liberated from one-dimensional understandings of natural processes, rationalistic limitations, and reactions to biblical literalism. From this perspective, progressives can have broad and evolving theologies which embrace the energy of Pentecostalism and the trans-rationalism of mysticism. The healing of the woman with the flow of blood is a case in point. Her healing is extraordinary in its manifestation of divine energies, but it is also naturalistic, drawing on the energies of creation to restore to health. The unnamed woman, who had suffered from the social stigma and physical pain of a gynecological ailment, experiences healing on multiple levels: cure of her disease, restoration of her place in society and religious life, transcendence of self-imposed limitations, and the emergence of deeper, more transformative faith. When Jesus asserts, “your faith has made you well,” his understanding of her healing goes beyond the impact of her individual faith to also include her openness to Jesus’ healing power and the release of divine energy. Her healing is truly multifactorial, a Christomorphic moment in which her faith is aligned with divine intentionality and Jesus’ ability to mediate divine energy. This healing is not supernatural but emerges from “very natural” processes such as energy, faith (placebo effect), the power of spiritual leaders, and an acceleration and enlivening of the healing processes residing in each person. Such healings are becoming more understandable, although they will always be, to some extent, mysterious and uncontrollable in light of our current and growing interest in the interface of healing and spirituality: the power of emotions and thoughts to change water crystals (Masaru Emoto), the impact of energy healing (reiki, therapeutic touch, liturgical healing) on physical and spiritual well-being in both curative and palliative ways, the role of religious activity in overall well-being, studies on the placebo effect and distant intentionality or intercessory prayer in promoting well-being and recovery from illness, and the growing interest in joining the insights of yoga, traditional Chinese medicine, and Western medicine. Bruce Epperly is a theologian, spiritual guide, pastor, and author of twenty three books, including Process Theology: A Guide to the Perplexed, Holy Adventure: 41 Days of Audacious Living, Philippians: An Interactive Bible Study, and The Center is Everywhere: Celtic Spirituality for the Postmodern Age. His most recent text is Emerging Process: Adventurous Theology for a Missional Church. He also writes regularly for the Process and Faith lectionary. He recently served as Visiting Professor of Process Studies at Claremont School of Theology and Claremont Lincoln University. He may be reached at drbruceepperly@aol.com for lectures, workshops, and retreats. His latest book is Healing Marks: Healing and Spirituality in Mark’s Gospel (Energion). I'm cautiously optimistic about this. I used to believe like Dr.Epperly with gusto. Then I started being more conservative by employing a naturalistic approach. I've practiced tai chi and reiki. There is no reason why these things cannot be true. At the same time, I'm not aware of double blind and peer reviewed studies that have revealed such phenomenon to be probable. Still, I have faith in the Living Christ and do believe that amazing healing can, and does, happen. I would have left out the placebo effect in parenthesis around faith as an attempt to show a direct relationship between the two. Bringing the placebo effect concept into this article was not necessary and confusing. That's interesting Henry. I see it differently. I think that the placebo effect may very well be a way to measure the impact of faith. Bob, just what was it in your Pentecostal background that makes you believe "that God can and does heal/cure people." I'm not doubting, just wondering. I've heard numerous claims out of Pentecostal sources, yet, like Brian, have never been able to authenticate any. Epperly does a good job in laying out the conditions in which it could happen, but where is the evidence that it has? All he offered here is on the order of let's take these stories literally, they could have happened. Steve, that's a good question. Although I have a strong sense of skepticism, my Pentecostal experiences suggest to me that there is more to our reality than the physical, which is what Bruce seems to be getting at. I know that there were lots of hucksters who became healing evangelists, but I'm not sure that all reports are hype. In fact, I've read enough about Aimee Semple McPherson to have concluded that there must be some truth to the testimonies of healing. Are they psychosomatic in origin? Perhaps, . . . So, I guess I'm open to the possibility, though David Hume is always barking in my ear!